We all seem to be customers of Amazon. First, it was books, then CDs and DVDs, and now it is a lot more. 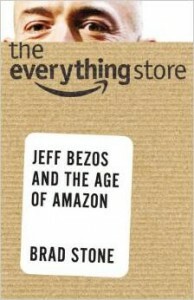 To understand this process you really need to read the book-describing founder and CEO Jeff Bezos’s strategy. The book is aptly called “The Everything Store,” and it truly takes you behind the scenes to see his relentless pursuit of owning your buying relationship. One of the latest Amazon devices is the ECHO. Watch the video on the Amazon site if you aren’t familiar with them. Click here to learn more about the ECHO. On the surface, the device seems to be a version of Apple’s electronic personal knowledge assistant, Siri. But, it is much more. On the surface it seems like a really good music speaker. But, once again, it is much more. Susan and I have our ECHO in the kitchen where we enjoy hearing whatever music we requested played. This “speaker” has revolutionized our listening experience. We no longer go searching for channels, discs, or even a remote. We simply say, “Alexa, Beethoven’s 9th” and the music plays. Need to know the weather, the traffic, who won last night’s game, the area code for Lexington KY, or what year Benjamin Franklin was born? Just ask Alexa. But, there is more. Our favorite feature is putting items on our grocery list. “Alexa … add olive oil to my shopping list.” And olive oil appears on the list on my mobile phone. Then, at the store, I check the list, and there it is. Simple enough … but wait … there’s still more. Amazon is about to launch home delivery of groceries to many major cities. That’s right. You can see where this is going. Get ready for Alexa to ask whether you want that shopping list delivered … right now. Why go out to the store? This reminds me of the local office supply store whose representative came to our office to inventory our pens, pads, paper, etc. and to let us know if we were running low. With 30+ employees, who has the time to worry about that? They apparently do … and of course, they then deliver what we need just as any other supply company would do. They are stepping in and owning the customer experience. Here is one more example of thinking ahead and working to own the customer relationship that makes this same painful point. It was about 20 years ago that I audited Quaker State Oil’s refinery in Pennsylvania. When I met the plant manager, I commented on how proud I was to do the audit because I had such high regard for and always preferred using Quaker State oil. The plant manager thanked me for my loyalty, but then asked, “Do you change your own oil?” That question stunned me … he was right … I didn’t. He then told me the refinery was on the verge of closing because their rival Pennzoil had thought this all through and had opened Jiffy Lube oil changing stations to own the customer experience, and they were not buying Quaker State oil. There certainly is an important lesson here.